When you are a home owner, there is always something that needs fixing it seems. If your gutters are looking worse for the wear and you are starting to notice water damage every time there is a heavy rainfall, then it is probably time to replace your rain gutter system. Because rain gutters can come in different materials and different configurations, it can be a little nerve-wracking to figure out which rain gutter system is best for your house. Your best bet is to talk to other homeowners who have recently gotten new gutters installed to see what their experiences were, and to seek out the advice of some gutter experts. They can help you understand exactly what you should be looking for and give aid on deciphering any vocabulary you might not be familiar with. Vinyl gutters have become one of the most popular choices for gutter systems. Their benefits include the ease of installation and the fact that you never have to worry about them rusting. They are also a more economical choice. Because the pieces are lightweight and easily snap together, installation is also a lot less complicated making it easier for those homeowners who want to do the installation themselves. Vinyl and aluminum gutters are considered two of the best types of gutters because they are cost efficient, meaning that for what they cost, they do their job well. And they are not over the top expensive either. Stainless steel gutters are another great option, but they come with a heftier price tag. These gutters are the sturdiest of the bunch and they won’t rust at all so if you have the extra money to spend it is a good investment. With all these options, it can be a bit overwhelming. Remember though that the most important thing is that it does its job moving rainwater quickly and efficiently away from your home. The rest just comes down to the look you prefer and how much you can afford to spend. One of the last things you will need to consider is whether you are going to have them professionally installed or do it yourself. If money is a worry, you can definitely save by installing the system yourself, but you need to make sure you know exactly what you are doing and that you are following safety protocols. Avoid choosing the wrong size gutter. Because your gutters need to be able to be large enough to drain away all the rain from your home, finding the right size is crucial. If you go too small, the gutters will only get overloaded in heavy downfalls leading to a lot of water damage to your home. Avoid hanging the gutter hangers too far apart. The gutter hangers are the way you mount the gutter system to your home so they need to be spaced properly. If you leave too much space between the hangers, the rain gutters will actually start to sag causing the water to pool instead of flowing through. If this keeps happening and you have a lot of water pooling in different sections of the gutter system, the extra pressure is going to make the system separate from your home. The rule of thumb is to place the gutter hangers about every three feet or so, unless where you live there is a lot of snow and ice, then every 2 feet is better. Don’t ignore the pitch of the rain gutters. 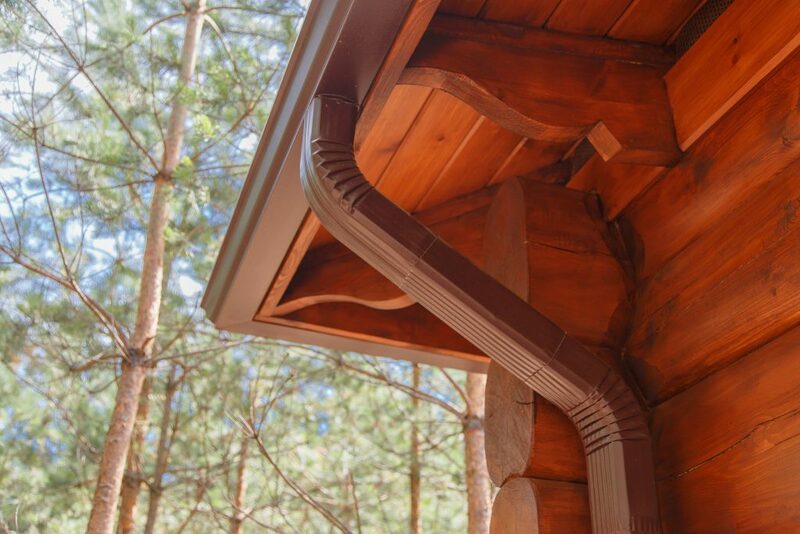 The angle at which your rain gutters are hung is an important detail when it comes to a successful installation. Both too much of an angle and not enough of an angle can affect the speed at which the water flows through the system. In this case, moderation is best. Experts recommend that you allow for a ¼ inch slope towards the downspouts for every 10 feet of gutter. The most important thing to remember is that the gutters should never be level. Avoid having too many seams. The seams in your gutter system is a weak point in the system where leakage can happen so you don’t want to have too many of them in your gutter system. When shopping for your gutter system, look for one that doesn’t have a lot of seams or better yet one that is seamless. Don’t forget the downspouts. How you place the downspouts and how many of them you install is also important. Not having enough downspouts will lead to standing water and overloading of the system during heavy rains. And when they are not placed properly you open yourself to erosion around the area, structural damage and even insect infestation, all of which can end up being pricey to fix. Don’t damage the gutters during installation. The installation process needs to be precise and you need to carefully avoid damaging any of the gutters during installation. If you are installing aluminum gutters they are especially at risk of getting easily bent or dented so be careful that you don’t let one fall to the ground or hit it with the ladder by mistake. If it gets damaged, you are going to have to replace the whole section and you want to avoid that as much as possible. Besides the gutter system itself, you should also consider purchasing and installing gutter guard, leaf catchers or other products that help you maintain your gutter system with as little hassle as possible. For example, The SpoutOff are rain gutter outlets that can be easily added to a new gutter system and they are designed with larger openings which prevent leaves and debris from getting clogged up in the gutters. They also make it easier to check on your gutters because it comes with a removable downspout that allows you to inspect the system from the ground instead of having to climb a ladder. Want to learn more about how The SpoutOff can make your seasonal outdoor chores a lot easier? Contact The SpoutOff today to learn how it can take the hassle out of cleaning your gutters.